Although the topic of this post is sisal rugs, it didn’t actually begin that way. 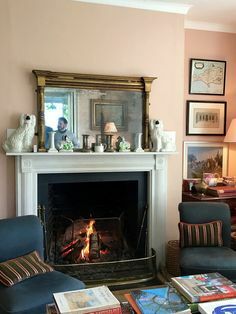 It began quite innocently because a local reader, Lotte Meister, invited me over for coffee and to see her 19th century Victorian Home in Rye, NY. Now, Lotte isn’t just a reader, but she’s also an interior designer/decorator and has a passion for helping people stage and style their homes when they are putting them up for sale. And not only that, in a world full of synchronicity, Lotte is 100% Danish, but has lived all of her life on the east coast. The day I showed up was quite pluvial. Oh, I learned pretentious words (that make me sound smarter than I really am) from my wasband. If you don’t already know, pluvial means that it was raining all damned day and humid as hell, but as we were getting the remnants of Hurricane Michael, it was surprisingly warm for the second week in October. When I arrived, I was struck mostly by the exquisite lushness of the property. But, make no mistake, the lovely old pale yellow Victorian lady sitting on about an acre, was mighty sweet too. Lotte was standing on her pretty stoop to greet me with the warmest smile I’ve ever seen. We did the grand tour of this incredibly lovely home and that is when I saw HIM. No, not exactly my prince charming. It was that snake dude, Pueblo Sisal Rugs. What on earth is HE doing here, I thought? And then I saw that he had cloned himself a few times. I saw at least three Pueblo Sisal Rugs! Okay. Anyone who’s been reading this blog for a while knows that I strongly recommend that you avoid sisal rugs! Here are some posts which discuss this. 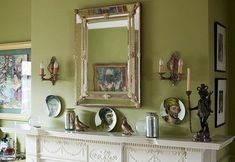 And since they appear in practically every editorial in House Beautiful and Elle Decor, I’ve quipped how the stylist must have a few in their van which they put down for the photos and then whisk away at the end of the photo shoot. But, this was not a photo shoot. This is a real-life family home that also comes with friends, (they love to entertain) relatives, pets and SNIRT! After all, this is Westchester County. Oh, you don’t know what snirt is? Please click the link and you will find out. I mean, they even have a Pueblo Sisal rug in the DINING ROOM! That’s definitely the Russian Roulette of area rugs. Laurel, Uhhh… who/what is PUEBLO SISAL? Oh, forgive me. Pueblo Sisal is a beautiful sisal weave manufactured by Prestige Mills. This company is owned by Steven Stark, CEO of the high-end carpet and rug brand, (to the trade only) Stark Carpets. Many of Prestige’s products are also sold through the trade showroom Stark Carpets. Pueblo Sisal is one of those. In a very small, scared voice I asked Lotte about the sisal rugs. “Oh, they’re great!” She said. “They are? Don’t they stain?” I asked in an even smaller voice. “Nope,” Lotte said quite confidently. I was in the living room staring at a sea of pristine sisal rugs and Lotte pointed to an area where a pet had, had an accident. There was nothing to see, except the beautiful weave of Prestige Mills gorgeous Pueblo Sisal. “It cleaned right up,” she said with her warm smile, now beaming with pride. Well, I’ll be. Talk about your epiphanies! But I swear, there was an entire feed on facebook where dozens of interior designers chimed in to say that their experience with sisal rugs is to “stay away.” Not one, said anything to the contrary. But here is concrete evidence staring me in the face. You can’t refute that! It’s making me think that I need to write a note of apology to Pueblo Sisal Rugs. I hope that you’ll forgive me. Although, we’ve only met in passing and I never specified you to clients, it is for this reason only. Dozens of other interior designers warned me about using sisal rugs, including my former boss from the early 1990s. Obviously, they didn’t mean you, darling Pueblo. Somehow you’re different and I must apologize for my ignorance. I’m sure that they must be referring to that poor cousin of yours, Bouclé Sisal. I must admit that she’s rather coarse and common. I should’ve realized that she had neither the class nor style woven into the very fiber of your being that makes you so special. Please, again, accept my profound apologies. I’m a fan. Actually, I always was in terms of your beauty. And now that I know that you’re not just a pretty face and a frivolous waster of money, I will sing your praises. Very cute, Laurel. Are we going to get to see the house? Of course you are! And that’s because Lotte kindly agreed that I should come back and photograph it, so that I could show y’all. Okay. There is supposed to be a photo of the front of the house. I saw it the other day after I took it. But there’s a gremlin or something in my phone because it’s not there any longer. However, I do have a great photo of the back of the house and this one below which shows the newest addition to this lovely old lady. They’ve lived in this home about the same amount of time I’ve lived in my apartment– six years. But not too long ago, Lotte found an old photo and at one time, there had been a charming porch, but it was long gone for some reason. So, they put it back, as you can see. I made Lotte turn off all of the lights, which do look wonderful; but only for the photos because usually the rooms look better with them off. However, I turned some on, just in case. And, I rather like this shot looking down the interesting and winding center hall. The photo doesn’t begin to do this justice. The ceilings are super high. The wall color is Benjamin Moore Ashwood OC-47 and the trim throughout is Benjamin Moore White Dove. Doubling back towards the front door, we’ll turn right as if we are just walking in to one of the prettiest living rooms ever. And here we are, in the airy two seating area living room. And there they are… The Pueblo Sisal rugs! They’ve been there for at least five years, too! See any stains? Not a one. The wall color in the living room is Benjamin Moore White Down OC-131. Have to say that those lamps are absolutely stunning when turned on, but alas, they’re off. Across from the first seating area is a fabulous fireplace surrounded by two giga-gorgeous and beautifully styled bookcases. This is what Lotte realized several years ago that she has a passion for. Styling and staging. Soon, her friends started raving over her beautiful vignettes and then they wanted her to help them. And thus, out of her love, a business was born. Oh Lotte, you can style my bookcases any day! That is just about as perfect as can be! And specifically, Lotte told me that she loves helping folks get their homes ready to go on the market. But then, when the people moved, which doesn’t usually take long because their homes sell fast, at least half of them want her to help them decorate their new home. I don’t blame them. I would too. Not only is Lotte fun to hang with, she’s very talented! Here is a vignette from the second seating area. And, another sisal rug layered with a zebra striped rug. And too funny, but I’ve done that Oly table at least two times. You can see it in my portfolio and I also did it in this living room refresh from three years ago. Lotte told me that she loves quiet neutral fabrics and colors. And that is throughout her home. To this neutral scheme of beiges and grays she’s added splashes of various shades of green, from a soft olive to this beautiful teal you can see in the pillow above. Window treatments are kept to a minimum if at all. She said that she wanted to preserve as much light as possible and also be able to enjoy the beautiful property which is abundantly green, even in the winter because of the many evergreen trees. Beyond the living room is a den with office space for Lotte. Some of you might recognize these chairs from Serena and Lily. The Roman Shades are from the Shade Store. Lotte loves working with them, she says. I’m glad to hear that about another Laurel’s Rolodex source. The dining room is incredibly fresh and oh do I love those Chinese Chippendale chairs. In fact, there are some this week in the hot sales widget. The wall color is a Laurel Home Collection color, Richmond Gray HC- 96. You can also see it in this post. The beautiful crystal chandelier came with the house. And, both Lotte and I agreed that it is perfect in the dining room. Much of her lighting is more contemporary and comes from Circa Lighting another favorite source in Laurel’s Rolodex. One of Lotte’s many talents is the ability to put together different hanging light fixtures and lamps and they all look great near each other. And on the other side is a cabinet from Oly and inside is oh my, can you believe it? A gorgeous set of ROYAL COPENHAGEN! It’s just a total sync world sometimes! Lotte’s husband’s office also has a sitting area that’s as fresh as can be. The two chairs are vintage but newly upholstered. The stunning wallpaper is Meg Braff’s Ferns. 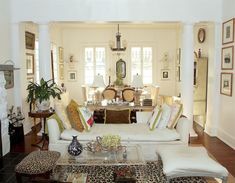 Meg Braff is one of my favorite interior designers. Laurel. Does she have a kitchen? Oh silly! Of course she does! And, we’re coming to it right now. read The Laurel Home Essential Paint and Palette Collection. And FYI it is not available in print, but several people who’ve purchased my downloadable digital products, do have them printed out. Lotte’s husband did this for her at his office. You definitely need a heavy-duty commercial machine. The fabulous coffee table is from one of my favorite vendors as well, Red Egg that is one of my featured vendors in Laurel’s Rolodex. Lotte designed the wonderful new TV cabinet. And check out the caning detail on the doors. Brilliant! Lotte’s style veers to the Hollywood Regency which totally suits this home. Kitchens by Deane helped Lotte out and she recommends them highly if you’re in the Westchester County area. I have also heard good things about them from other people. Yes, it’s a La Cornue! Stunning, ain’t it? Remember this wonderful black and white kitchen from a few months ago? I love this shot and the composition. And look! There’s a Dunes and Duchess candelabra from my friend and colleague Stacy Kunstel. You can see their fabulous booth at the High Point market a couple of years ago. And this was the first time I met Stacy. Out the back door we come to a beautiful deck. Me like! Here’s Lotte. So sweet. I was cold, so she ran in to get my jacket and I couldn’t resist getting a quick shot of her. And now, I have a bonus treat for you. The house comes with a barn! And apparently, it was a total wreck when they bought the house and so they renovated it and it’s now more glorious than ever. They are using it as both a garage and a wonderful space for entertaining. Fabulous! I feel like I’m in a Nantucket beach house! (even though I’ve never been to Nantucket. haha) There’s a bar and the coolest fridge on the planet. There’s a nuker (microwave), however, they decided that they didn’t want to do any heavy cooking here, so no range. It’s like a little vacation cottage only 50 feet away. That works! Up the stairs, a birds-eye view. The runner on the stairs LOOKS like sisal, but it’s actually an indoor/outdoor polypropylene that Lotte says wears like iron! I do not know the brand name. Sorry. And, there’s a bedroom for me if I decide to stay over. ;] Just kidding. And a Moravian Star chandelier too! Please check out this wonderful Moravian Star Pendant on sale! And I love this simple bathroom with an awesome porcelain console sink. The herringbone pattern tile is a wonderful accent. Actually, all of the bathrooms in the house are gorgeous and each one different from the others, but coordinated. Well, I hope that you enjoyed that. I would describe my niche as smaller interior decorating jobs and occupied real estate staging (as opposed to vacant real estate staging). I am a whiz at using what people have and adding and subtracting to make their spaces more current and attractive. Whenever I stage, people tell me they wish they had done that before they were selling. I love styling as well. Bring me your bookcases, coffee tables, consoles etc. I like to wake up tired spaces – whether people are staying or selling. That is so good! I highly recommend styling your home before selling. It makes such a difference! Please check out more of Lotte’s home and work on her beautiful instagram account. And of course, follow her. There’s actually more to the story, because Lotte is also an antique dealer, and wait until you see the place she took me to, but that will be coming up later. In the meantime, thank you so much Lotte for sharing your exquisite home. I can’t wait to pin all of these gorgeous images. So many great ideas! PS: Don’t forget to check out this week’s hot sales. Some really great ones and some are ending very soon. Loving the beautiful Home, I like everything about it. Thanks for sharing it Lotte! Love the pendant lights in the kitchen. The black and brass ones! Any idea where they are from?! I have been reading your blog for years and always enjoy your style and sense of humor. Thank you and I’m sure that you mean well, however, I think you might have me confused with someone else. I’ve spoken of the wonderful seagrass rugs on this blog too many times to count, so I’m afraid that you’re preaching to the choir. I’ve done dozens and dozens of seagrass rugs for clients too. Here is a link that will take you to every time I’ve talked about seagrass or sea grass. I probably spell it both ways. Oh, and I know that’s not all of them. You can see seagrass in this home I did a few years ago. Hi everyone. First of all a huge thank you for the kind words about my house. Decorating her has been a labor of love. She has been around a long time (circa 1873 they say) and it is a privilege to be able to bring her into the 21st century while still respecting her ancestry. Another big thank you to the one and only Laurel Bern. I have been an avid follower of hers for years and I still can’t believe she sat in my very kitchen and took such an interest in my home. I am honored and so happy to now call her my friend. On a more mundane level, I know that there are lots of questions about my sisal rugs. I think my particular sisal is so forgiving because it has a tonal texture to it. The raised part is a little lighter and the lower part is a little darker (dirt colored actually). So stains and everyday dirt kind of get camouflaged. I think flat non textured sisals tend to be less forgiving, especially in the lighter colors. In my opinion the bigger threat to these rugs is copious amounts of liquid that don’t get soaked up right away – that will distort the shape of the rug once it dries. But little spills here and there are no big deal. I am happy to answer any more questions about rugs or anything else either here or through my own Instagram account. THIS house. Oh. My. God. I LOVE Lotte’s house. I would not change a thing. Stunning. This is my favorite of all that you’ve posted, Laurel. Thanks for showing it to us. I loved the Pueblo rug so much I bought it for my bedroom and a runner for the hallway thinking it would be safe from excess traffic. But my poor Springer Spainel had a terrible “accident” on the runner and I was sure that it was ruinedBut with some Host carpet cleaner it’s good as new. Beautiful home, thank you for sharing. An absolutely beautiful home! Thank you ladies for the tour and sharing your expertise. Lotte is a little overwhelmed with the attention she’s receiving on instagram alone. And, you can definitely find her there. Long sigh…! What a lovely home and equally lovely photos and blog post. Another sigh! I so wish there were someone like Lotte who lived near me that I could hire. It would be so wonderful to have help accessorizing (since I have to live with the upholstered pieces we already have). And to help with other “little” things, like picking out handles for the kitchen. The oven broke and can’t be repaired. We cannot get white without a hefty surcharge!! So now all the appliances must be replaced to have them all the same color. Good excuse the change out the 20+ year old hardware — but with what?? I need a Lotte! Please. Ramble away! I think that we all need a Lotte. What she told me is that she loves doing smaller jobs. Styling and decorating. That’s actually very rare. But, I get it too. Large jobs can be intense– especially if one is a solopreneur. She’s a little overwhelmed with the response on instagram alone. Please see my reply to Mary regarding how she keeps her rugs clean. Yes, absolutely, one must use a rug pad, actually under any rug. They hold the rug in place and also extend the life of the rug, no matter what it’s made out of. Sorry you had that happen. I had something similar happen with some Alien strength double-stick tape. I saw my life flash before my eyes as it was for a client. Fortunately, it did come up off the floor without damaging it. And actually, Pottery Barn seagrass rugs are an excellent quality manufactured by Fibre Works which is my favorite vendor (to the trade) for all natural fiber rugs. (seagrass, sisal, jute, etc.) They have a version of sisal as well, that’s very close to Prestige Mill’s Pueblo pattern. 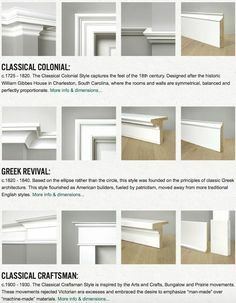 Laurel, Exquisite home photos. I have a similar traditional home and am enjoyed seeing the Black & White theme in the kitchen. We’re about to remodel our kitchen and have a few comments/questions. I am trying to convince my husband to do a matt black countertop surround on our current white cabinets (and maybe change up the island with a Carrera quartz top). Glad to see the recommendation on the black soapstone. More practical than polished black granite, correct? I also get concerned about dust showing up on jet black, so was thinking of a deep charcoal. 2nd question, where did Lotte get those lovely B&W barstools in the kitchen? Adds such personality. I love black and white kitchens and I think that Lotte got it just right. Those are actually counter-height stools. The way I remember it is that a chair seat for a regular table is about 18″ high, a counter stool = 24″ and a bar stool = 30.” I found them on Wayfair (link). They come in three colors and this is a very good price, too. Thank you, Laurel, for sharing this beautiful home with your on point commentary. I really enjoy tour writing and always read every word, not just look at the pictures. Well, it’s on the wall perpendicular to the fridge, on the other side of the door. Wow. Everything – and I mean everything – about this house is so beautiful. What a gorgeous home! Thank you and Lotte for sharing. This article is awesome! What a great way to pull together so many of the concepts that you teach in one place. My favorite of all was the Morovian star. that price is SICK!!!!! (good). Thank you for showing us this beautiful home. And thank you to Lotte for sharing. She certainly has a gift of making a large home look comfortable & cozy! Actually, I think that you’re ahead of most people in terms of your style. This post should help some with how best to narrow down the choices until you have a cohesive plan. Wow, that’s a beautiful home. I love the way she blends contemporary elements with traditional features. And I adore those teal fu dogs! Speaking of stylists, in Japan, when you move into a new apartment, you can hire a “decorator” who shows up at your home with an assistant and helps you place and hang all your art. Some landlords actually pay for this service, as they figure using a professional results in less damage to the walls. (Also, landlords would rather tenants not be killed by falling art and mirrors during earthquakes.) Helping people hang their art seems like it would be a great business here in the States, but none of my friends have heard of companies that do this. I realize I could hire a designer, but it’s not so easy to find the right person who is willing to do a relatively small job. I did once hire a museum installer to hang a very large piece, but I don’t need a curator for my apartment, just someone with a good eye and experience with the math of picture hanging. Wow, that is a gorgeous home! I like everything about it. Thanks for sharing it Lotte! It’s Lovely at Lotte’s House. The soft muted colors make this home feel cozy. I love the mix of furnishings. As you say, quite Hygge. Hi Laurel! Absolutely beautiful house, sophisticated, yet supremely warm and welcoming.I especially love the entrance hall with its graphic leopard upholstered bench, and its black and white accents! Just ravishing.. I will also give a plug to Garden State Soapstone here in New Jersey, because they managed to make my own old kitchen look new, yet still timeless, with the installation of soapstone counters. What a beautiful home! Thank you for sharing, Laurel and Lotte! Back when you wrote the post on sisal rugs, I commented that I have always had them for years now in multiple homes, with dogs and a husband,etc. They are extremely resilient. The key to spots on sisal is basically “do nothing.” NO water. Water stains sisal. Just let it dry. Because it’s natural, any odor will dissipate as well. On the other hand, if it’s seagrass, you can spray water or Nature’s Miracle, etc. on it…says the woman with two dogs! Don’t know about red wine…haven’t had that happen, yet. I’ve always known this to be true regarding seagrass. It’s a completely different animal; fine. Plant. And, it’s got a tough almost waxy kind of “finish” for lack of a better word. I don’t think that plants have a “skin.” But, whatever, it’s impermeable which is why you never see them dyed. So, what happens when your dogs or husband has an accident on the rug? (sorry, I couldn’t resist). But “doing nothing” also holds true for fine wool rugs. Or, at least doing as little as possible. Hahaha!Crime scene tape…I love it. And I’m laughing and crying at the same time because I’ve been cleaning our rugs quite a bit lately…one of our pooches is 13 and having some issues in that department! No urine odor that I can ever detect and I’m sensitive to bad smells! What does Lotte say/do? wowzer, Lotte is magical! so thoroughly enjoyed this tour!!!!! thank you for sharing Lotte! Hello Laurel, Lotte did a remarkable job of keeping the Victorian angles and moldings, while making the house light and airy. I would love to see the front of this house. Couldn’t Lotte send you one, or does she prefer to keep it private? About cleaning the rugs, those little Bissell machines that scrub and vacuum simultaneously often work wonders. Oh, these were taken with my phone! an eyephone 7s. But, one time I showed up with my DSLR camera and yep, busted memory card. I had no idea about a memory card– never even heard of it. Lesson learned. The phone is so easy and much faster. But with a real camera, I get lens distortion which is noticeable on straight-on images, but fixable in Gimp. With a cellphone, it’s a perspective distortion. And that’s what makes shooting the bookshelves an absolute nightmare. lol I spent a lot of time on Gimp yesterday.